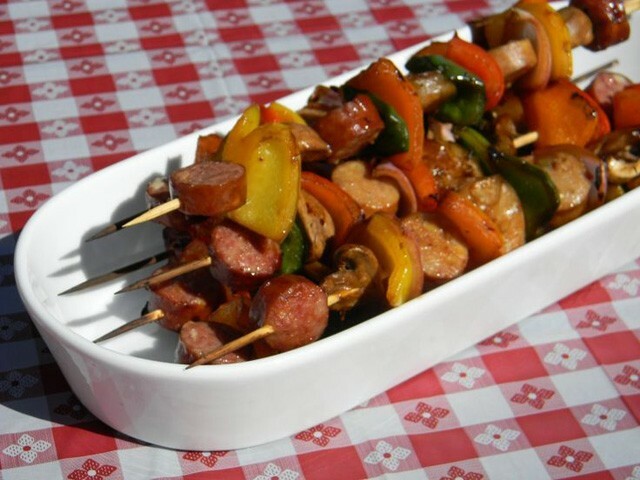 Sweet'n Sour Farmer Sausage Skewers are a fun and easy way to please your guests. Wow them at the table with these skewers! In a large non-stick skillet, heat canola oil and add sliced farmer sausage. Cook sausage until its done. Add vinegar, brown sugar, soy sauce, ketchup, and pineapple juice. Bring to a boil. In a separate bowl combine cornstarch and cold water, mix well and stir into hot mixture. Cook until mixture is thick and transparent. Cut red bell pepper and pineapple into bite sized pieces. Assemble farmer sausage, bell pepper and pineapple onto skewers. Serve with remaining sauce.